The Smart Museum of Art acquired 9 new works of art (PDF list of acquisitions) to lend out to University of Chicago students through the Art to Live With program. The works—by Suzanne Anker, Sabba Elahi, Ester Hernandez, Takashi Murakami, Kevin Pang, Gordon Parks, Pope.L, Alison Saar, and Orkideh Torabi—were proposed and selected by a committee of College and graduate students and represent the first significant expansion of the Art to Live With collection since the 1960s. The works were selected by 10 students in the Art to Live With Collections and Acquisitions Committee, based on a collecting plan designed to expand the collection and tell a broader story across geographic and temporal spaces. The original collection was assembled by Joseph R. Shapiro, a UChicago alumnus and founding president of the Museum of Contemporary Art Chicago. Shapiro was passionate about sharing his collection. In a 1969 interview, he said that “the enjoyment of art is something that multiplies by division...share it with people and it becomes a communal experience, a motivational force for drawing people together.” The works in the original Art to Live With collection—including prints by Marc Chagall, Eleanor Coen, Francisco de Goya, Margo Hoff, Joan Miró, Pablo Picasso, and other American and European artists—have been shared with thousands of students over multiple decades and will continue to circulate through dorm rooms for the duration of the program. 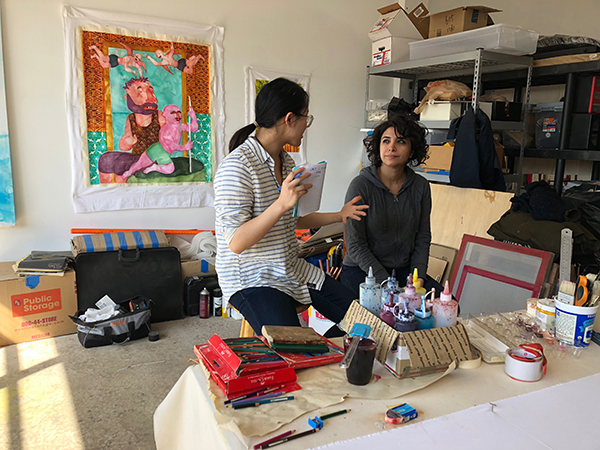 Throughout the academic year, the student Collections and Acquisitions Committee made studio visits with artists and met with collectors, curators, auction-house professionals, and gallerists. Then, with guidance from staff at the Smart Museum, they identified specific works to propose for acquisition, researched the works, and wrote proposals defending their acquisition. They presented their proposals to the Student Advisory Committee during the spring quarter. Two additional works were acquired from artists within the University community. Kevin Pang won the inaugural Art to Live With Department of Visual Arts (DoVA) MFA Acquisition Award. In addition, artist and DoVA faculty member Pope.L donated a drawing to the collection. The students also engaged one of the new Art to Live With artists to perform a new collaborative work. Sabba Elahi and dancer-choreographer Ahalya Satkunaratnam will present Darmiyaan, a meditative drawing and movement performance at the Smart Museum on May 27 at 3 pm. The performance is free and open to all and will be followed by a discussion and small reception. The works listed below were added to the Art to Live With collection and will be made available to students living in University of Chicago residence halls during the 2018–2019 academic year. Students will have the opportunity to preview works during the ART-B-Q on October 4, 2018, 5–8pm and select works during Art Match on October 7, 2018, 8am–noon. Acquisitions funds were provided by Greg Wendt (AB ’83) and a grant from UChicago Arts supported the work of the student committee.